Lucky’s Market opened its first natural and organic grocery store in Georgia today at 5501 Abercorn Street in Savannah. Opening day activities included a bacon-cutting ceremony and a presentation of more than $10,000 in Impact Grants through the Lucky’s Community Project to support two local non-profit organizations. Donations will be made to assist Step Up Savannah to help provide workbooks, scholarships and bus passes to underprivileged adults involved in their Workforce Development Program, and the West Broad Street YMCA’s Growing Edge Garden Program to expand their kitchen, and assist in the state licensing program to further their efforts and reach. The Savannah store is the fourteenth store nationwide for Lucky’s Market, a Boulder, CO, based favorite. Health Fair on Saturday, October 24 from 11 a.m. to 3 p.m. with vendor samples and gift basket giveaways. Local Food Fair on Sunday, October 25 from 11 a.m. to 3 p.m. with local vendors and food samples. Taste of Lucky’s Market on Saturday, October 31 from 11 a.m. to 3 p.m. featuring a variety of housemade foods, live music and entertainment for kids. Reusable bag credits through the end of the year, shoppers reusing their shopping bags can choose to get a 10-cent credit on their purchase or to send a donation to Blessings in a Bookbag, For Heart Sake, or Savannah Bicycle Campaign. February 10% Day in which 10% of one day’s total net sales will go to YMCA Habersham to support their Early Learning Readiness Program. Lucky’s Market strives to support local organizations, resources and people. Unique to the new Savannah store will be a community table designed and built by Oxform Studios, a local design and build studio in Savannah. The team at Oxform Studios is salvaging local materials and handcrafting this oneof a-kind table that is inspired by the beauty of the local surroundings. 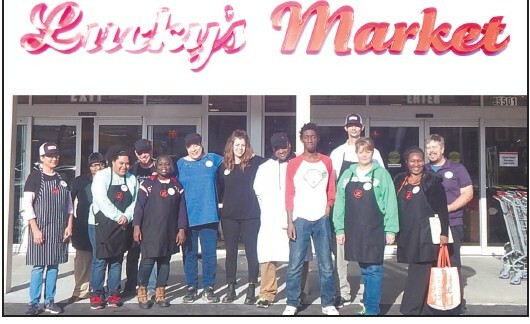 For more information about employment opportunities at Lucky’s Market in Savannah, visit their website at www.luckysmarket.com/workwith us/.